Editors Note: There are two maps associated with this press release. 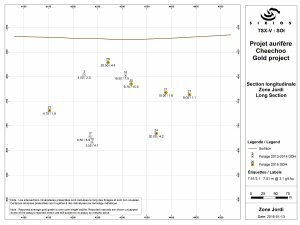 Drill hole# 28 has intersected the up-dip extensions of zone Jordi and zone I that were intersected by drill hole #18 with 1.53 g/t Au over 19.5 metres and 2.79 g/t over 22.5 metres respectively (press release 8 December 2014); these zones were also intersected at around 30 metres below the hole #18 by hole #20 with 15.61 g/t Au over 9.7 m; 15.04 g/t Au over 12.3 m (press release 1 December 2015). Two long sections showing the relative positions of gold intersections in zone Jordi and zone I are available at the following link: http://sirios.com/files/LongJI.jpg .With only few drill holes, the zones Jordi and I have already been intersected over an area of around 300 m and 125 m laterally, by 170 m and 225 m, respectively, after their dip. 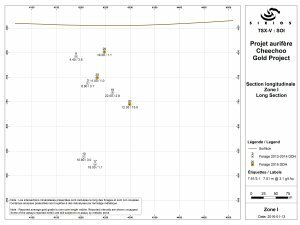 Drill hole #24 has also intersected another gold zone, Zone K, yielding 1.58 g/t Au over 16.1 m where the edges seem to have been intersected by drill holes #22 and 27. The gold zones seem to form stacked tabular structures comprised in a low-grade gold halo. It seems there are at least four distinct zones in the property, however, only additional drill holes will allow to identify the number of zones as well as their extents. All identified zones remain open in length and in depth. Other gold zones with lower gold grade or with smaller lengths were also intersected, as indicated in the table below. Dominique Doucet, President of Sirios states: ''It is exceptional from the first five thousand metres, undertaken in a grass-root exploration project, that we are able to already identify numerous auriferous structures with several potentially economic intersections. 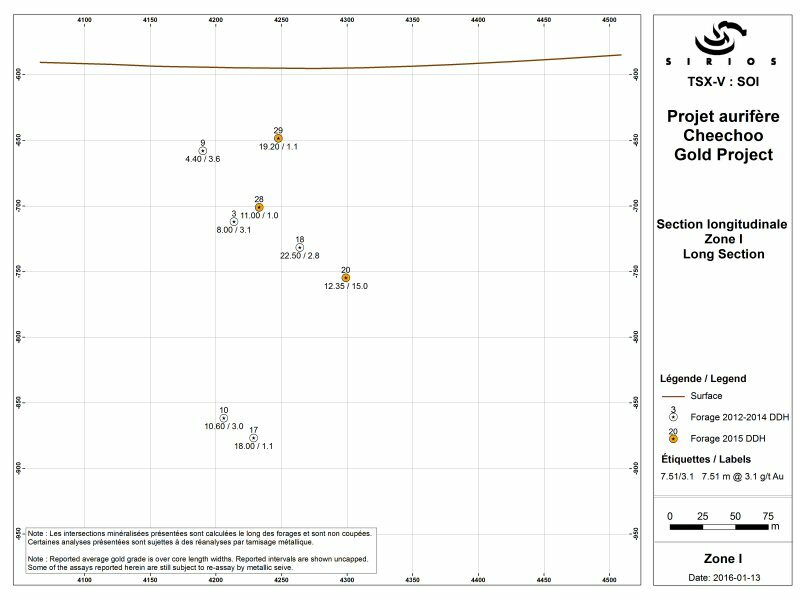 We are very encouraged to pursuit our exploration plan, as announced previously, with the objective to delimit resources in the actually known gold envelope while continuously to discover new mineralized zones outside of it. ms : Gold grade obtained by fire assay with metallic sieve of a sample of around 1 kg. Eleven diamond drill holes were completed in last September, for a total of 1,962 metres. All drill holes, without exception, have intersect gold zones, this press release, combined with the ones of December 1 and 16, complete the list of the main results, as of now. 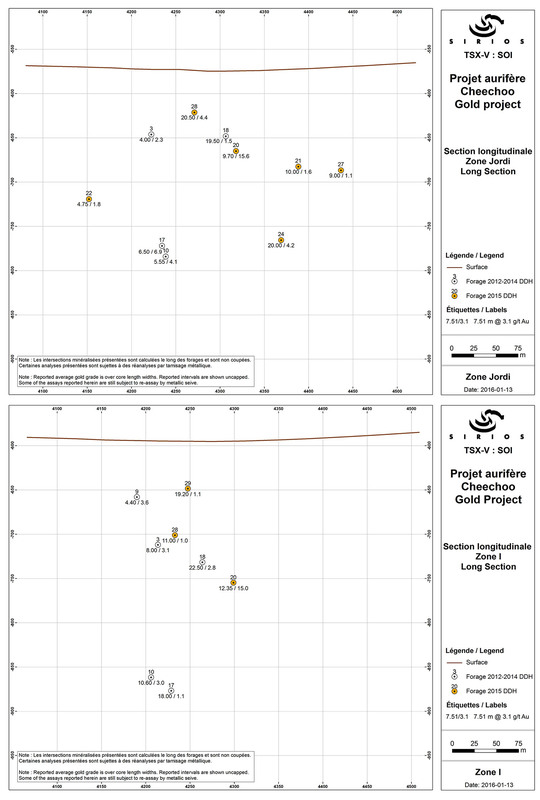 The CHEECHOO gold project is located in Eeyou Istchee James Bay, Quebec, 800 km north of Montreal and less than 10 km from the Eleonore gold mine of producer Goldcorp that has just begun production. This world-class deposit contained 4.03 million ounces of gold and 4.10 million ounces of inferred gold mineral resources (Source: Press release of Goldcorp, March 28 2014). In 2012, Sirios concluded an agreement with Golden Valley Ltd. regarding ownership of CHEECHOO allowing it, to upon completion of certain obligations and counterparts, increase its current interest to 100% (press release dated December 9, 2013). Sirios is the manager of the project. For holes #22, 24, 27, 28 and 29, 687 samples representing 855 metres of NQ drill core, were sawed in half, with one half sent to a commercial laboratory for analysis and other half retained for future reference. A strict QA/QC program was followed by integrating blanks and certified reference materials to the drill core samples, all of which were prepared by IOS Services Géoscientifiques inc. of Chicoutimi, and assayed for gold by fire assay and atomic absorption finish (AA24) by the ALS Minerals laboratories in Val d'Or, Quebec. Samples grading more than 3 g/t were re-assayed by fire assay with gravimetric finish. (GRA22). Sirios will be present at the Cambridge House International conference in Vancouver on January 24 and 25, located at the Vancouver Convention Center West, 1055 Canada Place, Vancouver, BC, V6C 0C3, Canada. We invite you to visit us at booth 419.